Rendering of B+SA's alternative proposal for the boundaries of Metrolinx's Georgetown South Corridor Expansion, promoting the use of new trees, living walls, and new trails and linear parks to soften the corridor's impact on neighbourhoods. 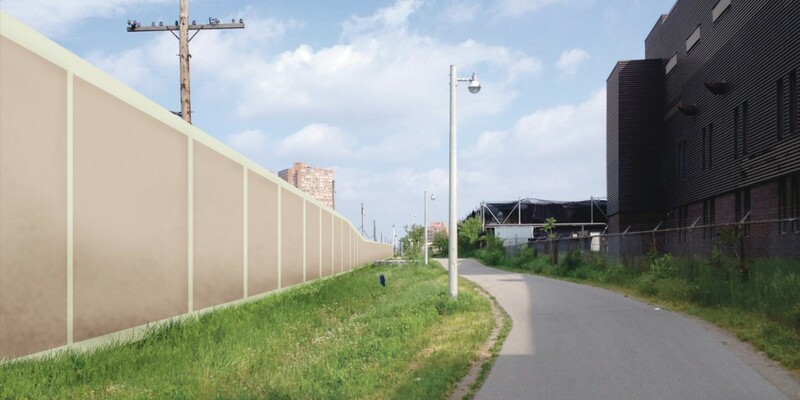 A rendering of the impact of Metrolinx's proposed 5 m noise walls on the existing section of the West Toronto Railpath. 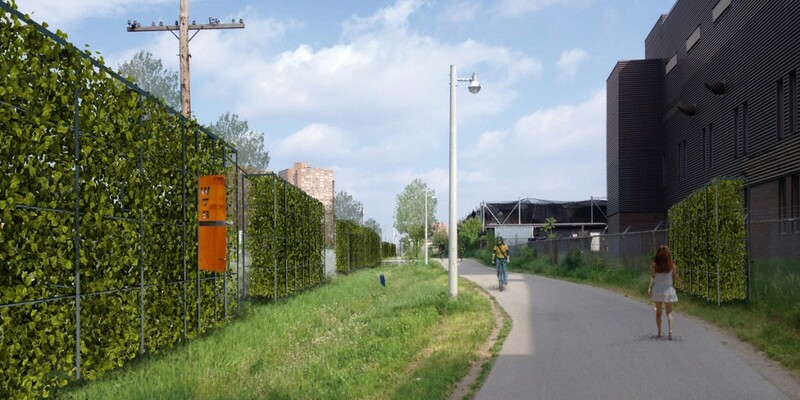 BROWN+STOREY's alternative proposal for living walls along the existing West Toronto Railpath. 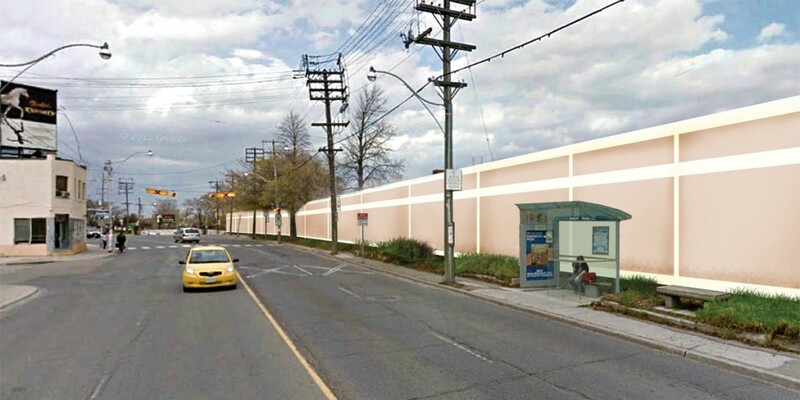 A rendering of what the 5 m conventional noise walls proposed by Metrolinx will look like along Toronto's Dundas Street West. BROWN+STOREY's alternative proposal for living walls and an expanded linear park space, remaking underused lanes on this section of Dundas. 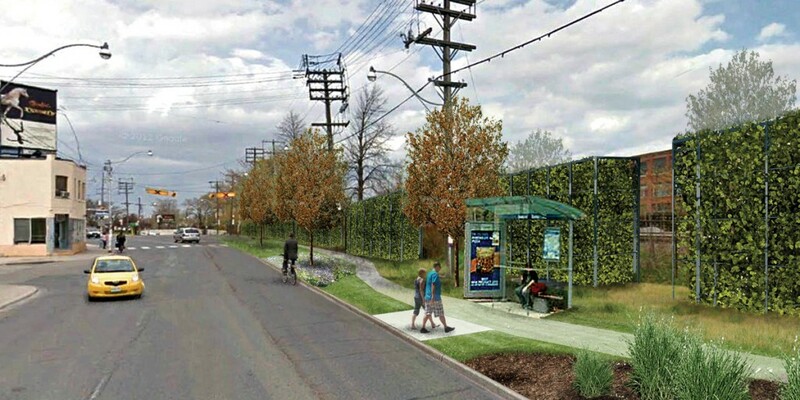 BROWN+STOREY's proposed alternatives included a significant tree planting program within the corridor. Metrolinx is expanding its commuter rail corridor through West Toronto in order to provide capacity for the Union-Pearson Express air-rail link and expanded GO Transit service to Georgetown, Guelph and Kitchener. The corridor passes through mature neighbourhoods and present-day brownfield redevelopment sites, and as might be expected the planned expansion of daily train trips on the line entails substantial disruption in these neighbourhoods. 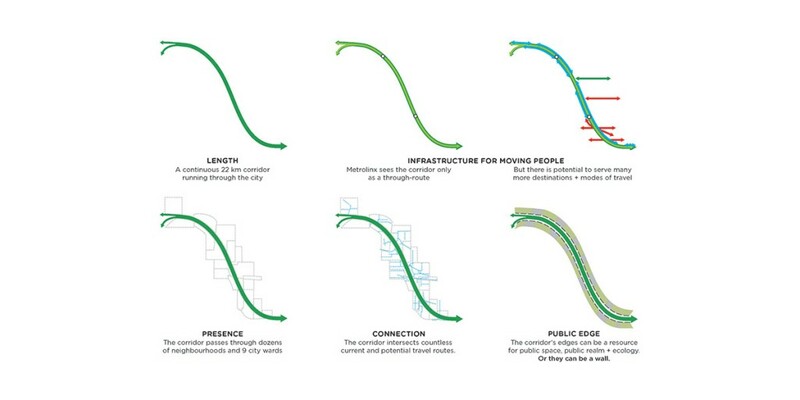 BROWN+STOREY were commissioned by local community groups to study shortcomings in Metrolinx’s plans for noise mitigation and corridor security. 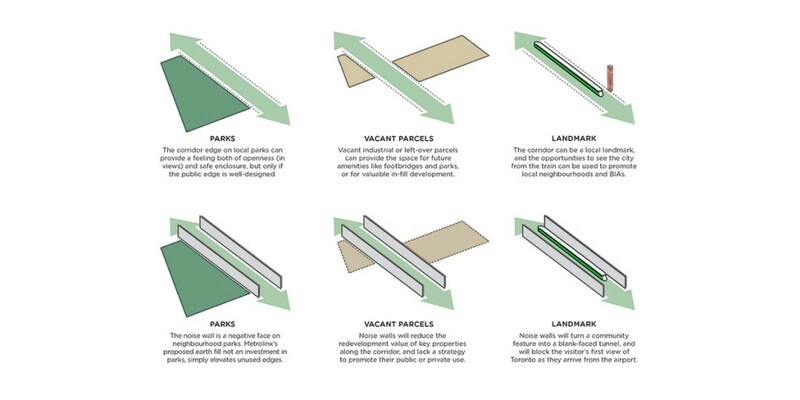 Official planning has focused on the proposed construction of conventional, 5 m tall concrete or vinyl barrier walls along significant stretches of the corridor, a move that the community anticipates will have severe consequences for local quality of life and neighbourhood aesthetics. 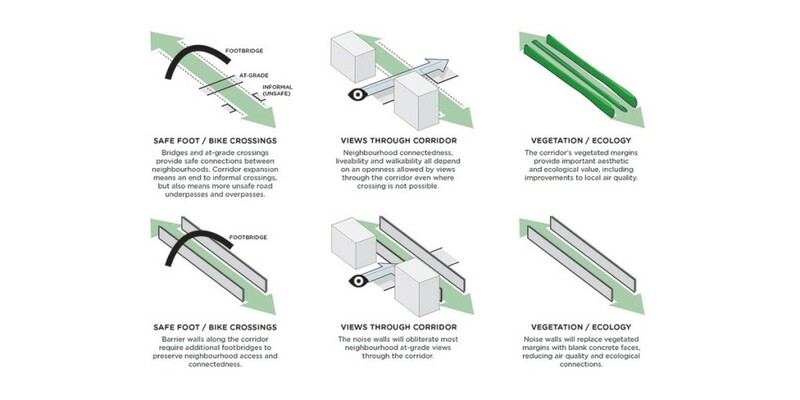 BROWN+STOREY’s alternatives demonstrate that noise mitigation could be coupled with aesthetic and ecological improvements, and leveraged to create both local public spaces and a multi-modal pedestrian and cycling route along the entire corridor. Such a trail system could be expected to spur redevelopment and improved urban outcomes along the whole corridor, as has already occurred along the presently limited length of the City of Toronto’s West Toronto Railpath (designed by BROWN+STOREY and Scott Torrance Landscape Architect, and opened in 2009). The community continues to use these proposals to press Metrolinx for better solutions to noise mitigation and to leverage the corridor for the benefit of all residents who live along it. 'We think that railway operations should be as responsive to the needs of the city as the city is asked to be accommodating of the railway operations, and that this philosophy (rather than avoidance and exclusion) should be driving our zoning and design decisions,' says Storey. And we at dandyhorse tend to agree. Enter Brown and Storey. The firm has a plan for no more money that will generate more public space and green the neighbourhood while helping to reduce noise and boost safety. Indeed, they are at complete odds with the basic purpose of transit. They don't connect; they divide... To degrade huge swaths of the city in the name of making it a better place doesn't add up. 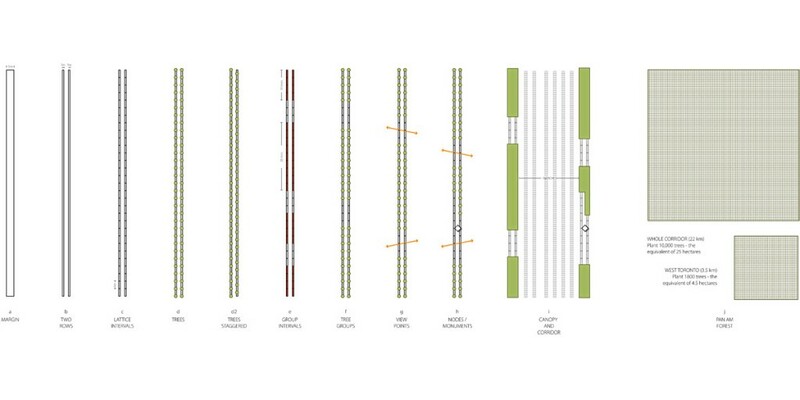 Unhappy at the prospect of what [Kevin] Putnam calls a “huge canvas for graffiti” along the tracks, members of the Junction Triangle Rail Committee and Wabash Building Society hired award-winning architects James Brown and Kim Storey to draft an alternative plan. 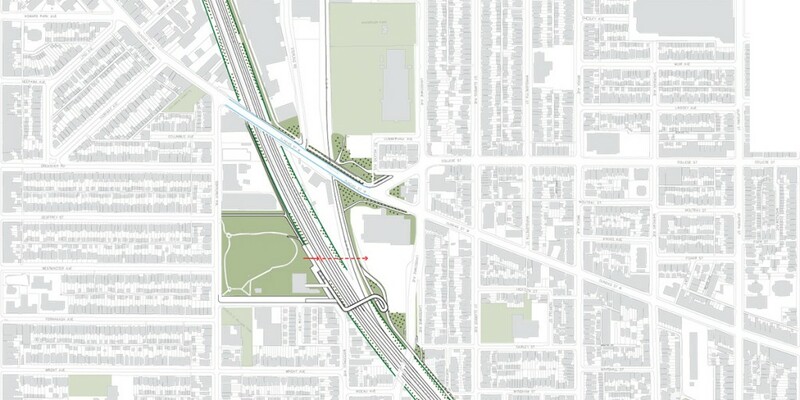 BROWN+STOREY was hired by two community organizations in Toronto to develop alternative strategies for the boundaries of the Georgetown South railway corridor, presently subject to a major expansion project by the provincial transit authority Metrolinx. 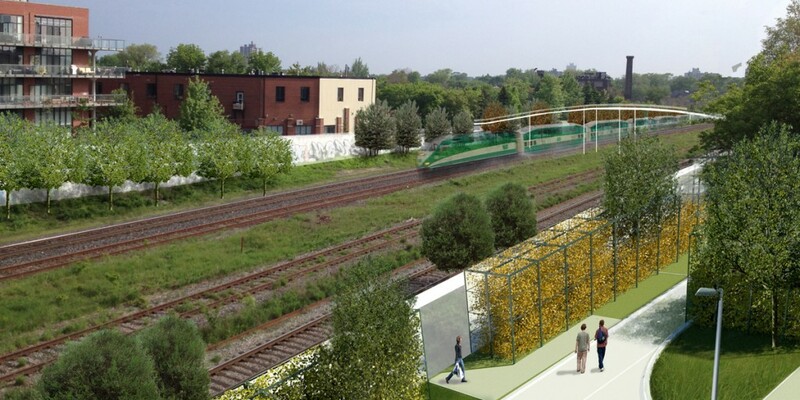 Metrolinx has planned 5 m height noise walls for much of the corridor’s urban edge within Toronto.